Are you looking to make your skin look younger? Lose it with Laser brings you the best Microdermabrasion treatment. Get your dead skin removed to provide the healing power of oxygen to your skin. Microdermabrasion treatments are a new game changer in skin treatments in the fight against ageing. When we are young, our skin renews itself every 28 days but as we age, it can slow down to every 45-50 days. This is why as we get older, our skin can look tired, flakey, and dull. This dry dead skin layer, in turn, creates a barrier, which means much of the expensive skincare that we use is wasted as it never gets absorbed to the layers of the skin where it is needed the most. Microdermabrasion treatment is when the top ‘dead skin layer’ is removed by passing a diamond-tipped wand over the skin. 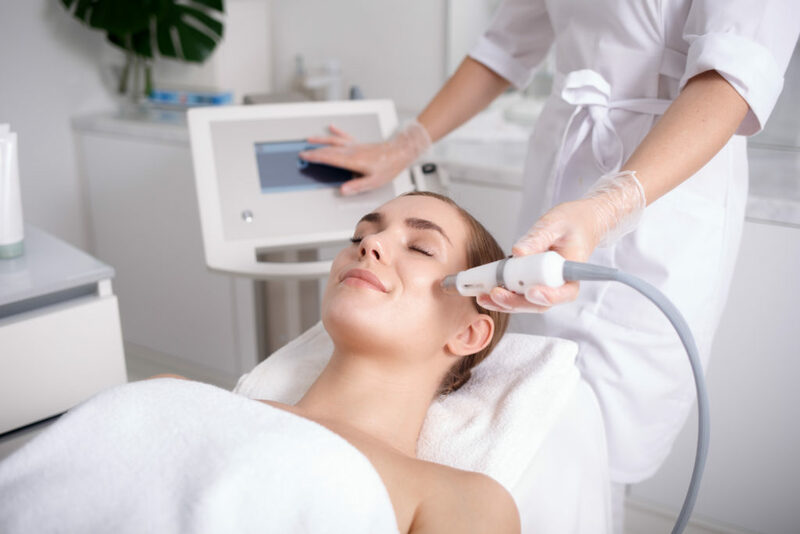 The dead skin is also vacuumed away using suction, resulting in smoother skin with improved texture, a youthful glow and at the same time stimulating collagen production as a result of vascular stimulation and oxygen proliferation. It is an excellent treatment to address a range of skin conditions such as fine lines and wrinkles, enlarged pores, acne scars, pigmentation and even improve the appearance of stretch marks on the body. The treatment itself is very comfortable and painless and may leave the skin with a healthy pink glow. You can definitely resume usual daily activity straight after a treatment, as there is no downtime. From the very first Microdermabrasion treatment, you will see immediate visible results and depending on the initial condition of the skin, a course of treatments may be recommended to achieve the desired outcome. Adding Microdermabrasion treatments to other therapies can supercharge results too. For example, having a dermabrasion before other treatments such as IPL or a peel can ensure a better outcome as the active solutions applied can be better absorbed. Why not try a treatment at our Microdermabrasion clinic in Melbourne, Box Hill today to see for yourself how much better your skin can look and feel! Your makeup will glide on and look more natural too as any creases on the skin are softened. (May not be suitable for extremely sensitive skin or those with active acne or open sores). Hydrodermabrasion is the latest technology. Now even the most sensitive skin can enjoy the benefits of Microdermabrasion treatments without any irritation. Using a high-velocity jet of microdroplets of oxygenated water, the natural healing powers of the oxygen can exfoliate the skin without using any abrasive wands used in microdermabrasion. Whether you are having a Microdermabrasion or a Hydrodermabrasion treatment, at Lose it with Laser, your treatment will be finished off with a pampering vitamin or serum infusion. It will supercharge the benefits of having the treatment by delivering much-needed nutrients through a fresher, more receptive layer of skin. Products used will be chosen to best suit the individual’s skins needs. You can address hydration, congestion, pigmentation etc. Looking for a great Microdermabrasion service? Contact Lose It With Laser today on 0432 162 862 today to book an appointment with us.